This is an update to a blog I wrote a while ago about a personality trait called “Highly Sensitive Person.” It often comes up as a popular topic due to the many people whose well-being is negatively impacted by various stimuli in the environment (sounds, lights, smells, crowds, etc. ), so I wanted to share it again with some additional information. For a long time, it has been my belief that a good number of people with dystonia (which I live with) and other chronic health conditions have similar personality traits, one of them being “Highly Sensitive Person” or HSP. An HSP is a person having the innate trait of high sensory processing sensitivity (or innate sensitiveness as Carl Jung originally coined it). Roughly 15 to 20 percent of the population is considered HSP. I go into more detail below, but generally speaking, an HSP has a sensitive nervous system that makes it harder to filter out stimuli (sounds, lights, smells, crowds, etc., as mentioned above), they are aware of subtleties in their surroundings, more easily overwhelmed in a highly stimulating environment, and more in tune with the feelings of others. HSPs are often great listeners, cry happy and sad tears more often than others, get overwhelmed at large gatherings, want and need to spend quiet time alone, experience deep empathy for others, and struggle with feelings of anxiety and/or depression, to name just a few. Not everyone who is an HSP shares the same attributes and experiences, so these are just a few examples. 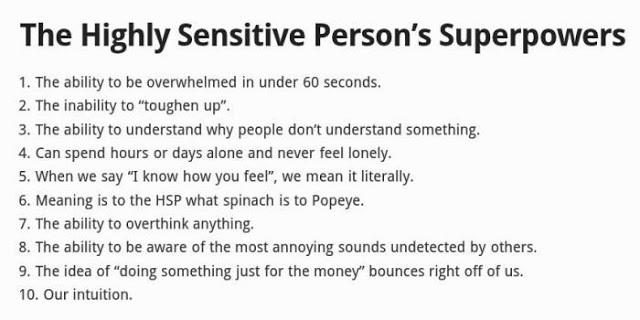 On the surface, being called “highly sensitive” could have negative connotations, but an HSP has many desirable traits. 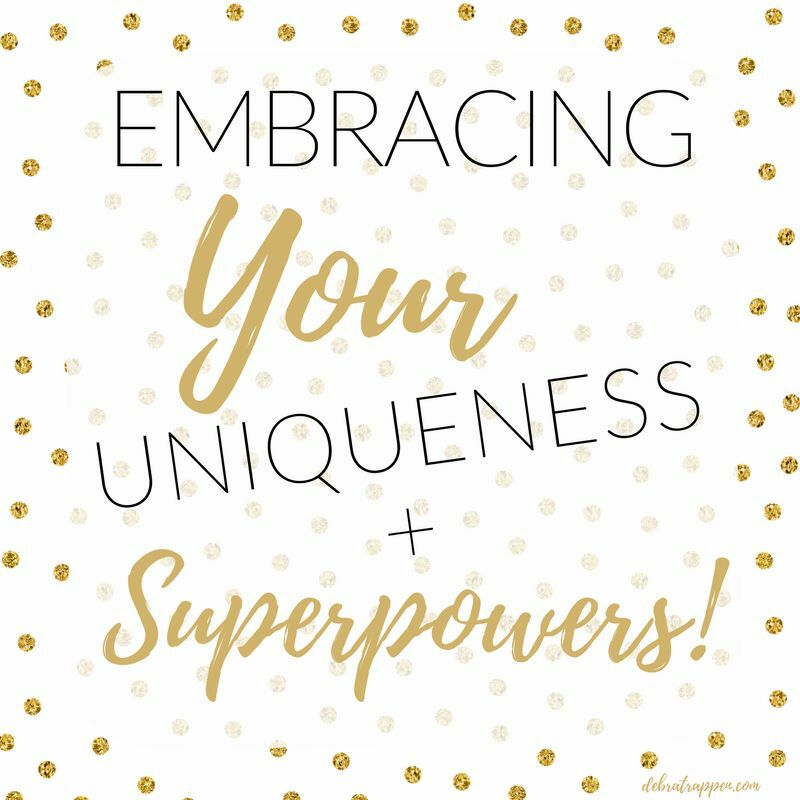 Common traits of an HSP include great imagination, a curious mind, high intellectual abilities, creativity, conscientiousness, and compassion. They are hard workers, problem solvers, objective, and able to see the big picture. HSP’s also tend to process events in their lives deeper and more intensely than others. This is due to a biological difference in their nervous systems which often makes them intuitive, assertive, and strong willed. On the other hand, HSP’s can take things too personally, over-analyze things, feel defensive, experience social discomfort, are easily aroused, are sensitive to subtle stimuli, shy, overwhelmingly sensitive to the moods of other people, and hold onto intense experiences and emotions. I believe that some of these attributes, especially the last one, may contribute to some of our health problems. When we hold onto intense experiences and emotions, it becomes stored in the body (somatic memory) and overwhelms the nervous system. This keeps us in an aroused and anxious state (fight, flight, or freeze), which prevents the body from healing from physical and/or emotional trauma (please see my book, Diagnosis Dystonia: Navigating the Journey, for more on this topic). It is when we learn to let go that the body is able to find its relaxation point to allow for healing. How we “let go” is different for all of us. It is a difficult concept to grasp and put to practice, but crucial for our well-being. In her book, The Highly Sensitive Person, Dr. Elaine Aron outlines the characteristics of an HSP and how to live more easily in our often chaotic world. One of the biggest keys for an HSP is setting boundaries and managing energy. An HSP spends the day picking up on deep feelings and moods of others, which can leave them feeling drained. Different sounds, lights, and busy environments also take a toll on an HSP. For example, a few weeks ago I had lunch in a loud, busy restaurant. I could barely hear the people at my table or follow much of what they were saying. I heard every painfully loud, sharp sound in the place. It was like I had a pinball machine in my head. I was only at the restaurant for about an hour and I was physically exhausted and dizzy afterwards, which altered the rest of my activities for the day. There are other examples of when this happens (and it is not just sound; all other senses can be affected), but for the sake of space, imagine if two people were yelling in each of your ears while you were trying to have a conversation with someone in front of you. That is how it can feel when exposed to stimuli (noise in this case) that overwhelms the nervous system. I have even heard people say that merely listening to or seeing a car blinker (or other repetitive stimuli) can be system overload, which should put into perspective just how sensitive the nervous system is for some people. 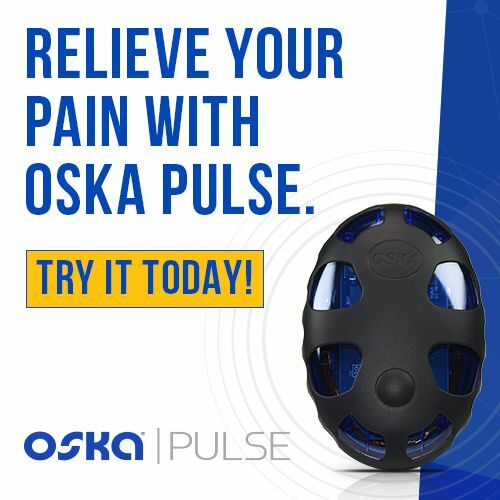 For people with chronic pain and movement disorders, such as dystonia which I live with, noise, lights, smells, crowds, etc., and especially all of these coming at us at one time, can moderately to dramatically increase symptoms. It is very hard for people not affected by these things to understand just how much the most seemingly harmless stimuli can bother us. For example, loud noises might reverberate like nails on a chalkboard through our head. Even a normal range decibel radio or TV, or the radio/TV on while someone is talking at the same time might be too much for us to handle for very long. 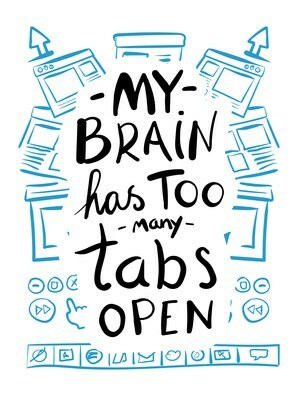 This is something that bothers me, sometimes to the point that I can’t concentrate and I feel the energy being sucked out of me. HSPs also tend to ruminate, which leads to further exhaustion. The trick for an HSP is not to put a personal story to every experience. 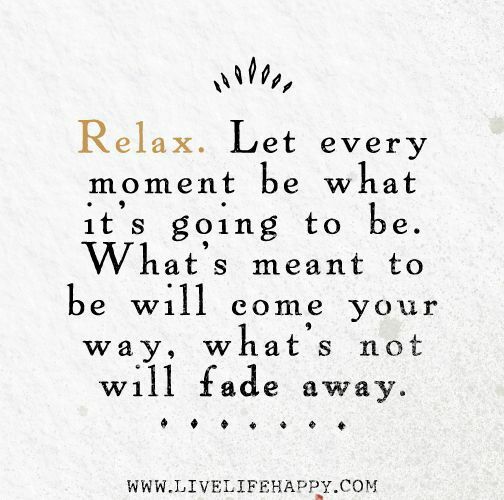 We have to learn to experience life and then let it go. The story line/meaning we give to experiences is often more painful than the experience itself because it lingers, causing a racing mind. For example, have you ever had a conversation with someone or been to a party and then immediately afterwards or when you got home you replayed every nook and cranny of your interactions over and over, wondering if you said the right thing, didn’t offend anyone or sound stupid, didn’t allow for your sensitivities or anxiety to show, etc.? If so, you know how incredibly exhausting this can be. Please work hard to let go of what is done and over with, trust in your “performance” and move on to the next new moment. Pay close attention to the input you allow into your life. Limit time with toxic people and be careful about the different forms of media you expose yourself to (the news itself, let alone social media, can be major system overload for an HSP). Lastly, if you are like most HSPs, you are a hard worker and demand a lot from yourself, so building in periods for rest and recovery in your day could be your saving grace. 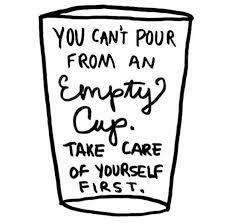 Self-care without guilt is of great importance. An HSP tends to do more for others than they do for themselves, which for probably most HSPs borders on being a “people pleaser”, leaving them to suffer the consequences. If you fit this description, please know that your worth is just as valuable as everyone to which you give so much of your time and attention. A little more loving kindness towards ourselves goes a long way in helping us better deal with all life challenges and not be so mentally and physically exhausted all the time. So, Tom, you just did a fantastic job of describing me. Totally resonate with this article. There is power in knowledge. Thanks for helping me see myself in a new light with tons of possibilities. I am so glad to hear that this resonated so much with you. I have found this to be a very common trait for many of us and when we tap into it, we can see that it is filled with possibilities and not limitations. I have many of these traits, especially sensitivity to sound in my home environment. I hear things at a distance that others don’t until they are right beside the source. Gunshots on TV are unbearable. I am already very isolated due to Illness and forced onto Involuntary Medical Retirement at 39 (now 56). I was a social person and my career provided very much opportunity to be with and meet new people. I still do better with people than isolated, sometimes for weeks without seeing or hearing another person. Nobody talks on the phone anymore. I’m married, but he’s Aspie and not able to empathize. I don’t have kids and my only sibling just died (no family) and my father is 91 with cancer. We lost our one dog in a freak accident about 2 months ago and tour last dog was diagnosed with advanced cancer 2 days later. I know of nobody else in the “end of the blood line” situation and unable to work or get out. Related to your other post, people are saying “be positive” and “choose happiness” while I am hurting beyond belief. It’s incomprehensible. I’m completely shut down and dissociated. I don’t know if this is due to high sensitivity or natural in the situation. Barb- thank you so much for sharing all of that. I know it will resonate with other readers. What an inspiration you are to live with so many challenges each day. If I can ever be of help, please don’t hesitate to reach out. I experience all of the characteristics in your article so your article hit home with me. I am an empath, psychic, have fibromyalgia and complex PTSD. As an empath, I feel the emotions and sometimes experience the illness of others. I am clairsentient as a psychic which involves feelings in the paranormal arena. Fibro people have a heightened sense of sensory stimuli which your article refers to as being highly sensitive. The symptoms are the same. 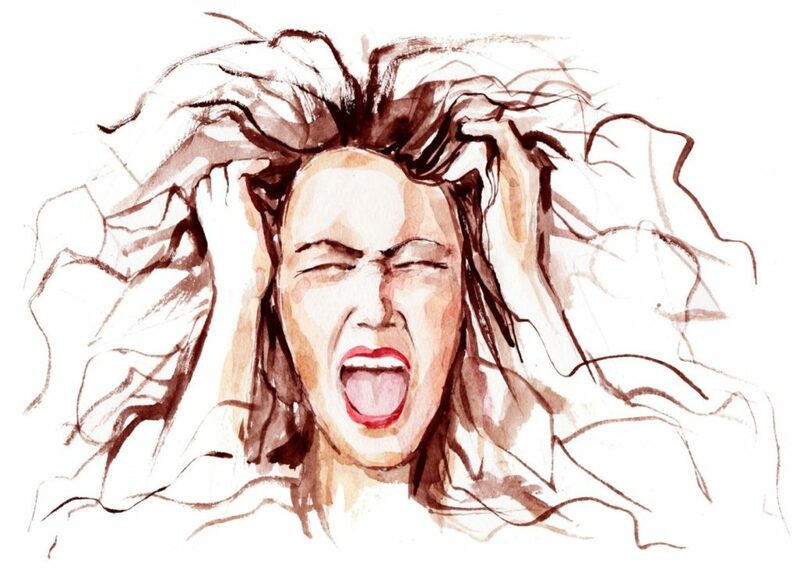 PTSD can produce a reaction to ordinary daily events because of a heightened state of hyperarousal. This state amplifies ordinary sounds for me. My parents would have been on track if they had given me the name “feel” for my middle name. Thank you Eileen. 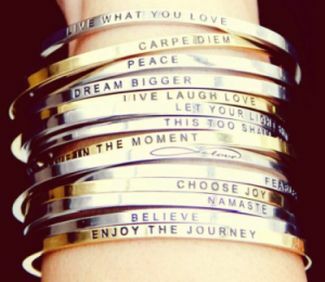 I agree with everything you said. 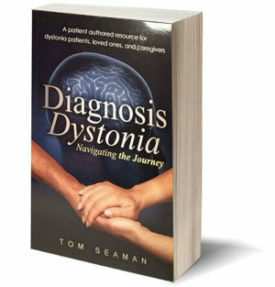 Hi Tom I just ordered your book, looking forward to tips and ways to cope with dystonia. I have always known I am highly sensitive. Like you said self care is so important, boundaries are a must. I have been exploring more about early childhood trauma associated with chronic illness so working on inner child work. Thank you Tom for being a light! Hi Mary- Thank you for your message. 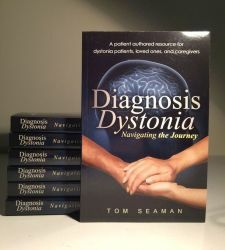 You touched on something that I think is very likely for many of us with dystonia and perhaps others conditions… trauma. I am so happy to hear that you are exploring this area in your life because I think it can yield a lot of answers. Very best wishes to you and thank you for getting my book. I would love to hear what you think when you have had a chance to look through it. Thanks! This was extremely interesting. Do you see a link between many of these traits and Aspergers? Thank you very much. I think there may be an HSP link to most any chronic health condition. This is just my opinion, but I see a big link between these traits and Aspergers. I would suspect that these traits are probably most common among those in the autism spectrum. I may have to invest in some of those noise cancelling headphones. I still have kiddos in the house, and I can’t exactly keep them and all their devices (tvs, iPads, laptops, phones) quiet! 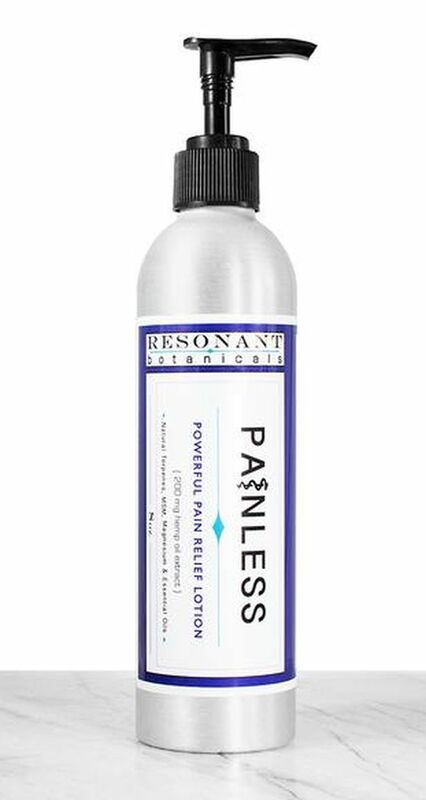 🙂 One thing I particularly like is essential oils or lotions with essential oils. I find smells like vanilla, lavender, and mint particularly calming. Hi Kim- I hear what you are saying… no pun intended whatsoever 🙂 I don’t have those headphones, but I have at times used ear plugs or earbuds with music to block things out. It seems to help. Some of those same smells are also relaxing for me, especially vanilla. The ocean is very soothing. And like you I find any body of water to be so peaceful. Sending healthy wishes to you as well! I didn’t know it was a condition until a few years ago. I find it fascinating and comforting to know that I am not alone in this. I agree that it could be a reason why we are more susceptible to dystonia and other conditions. Great article—I am an HSP. Most of what you described in your article rings very true for me. I had a mini meltdown last night. When I went outside to take some wet towels to lay on the back of the patio chairs to dry from our grandkids playing in the pool I locked myself outside accidentally. It was dark and there were some super loud frogs out there plus I hate mosquitoes so I had my phone in my pocket and tried to call my husband. He did not answer. I banged on the door and no one could hear and those frogs were getting louder by the second—tried calling him again and he answered. By that time I was so freaked out. I would like to say I handled the whole thing like a trooper but nope he got an ear full. Came upstairs to discover our Pom had a tummy problem on our carpet. Disgusting. Then our granddaughter saw the BIGGEST bug roach thing —not kidding it was the size of a mouse crawling on the steepest part of our bedrooms cathedral ceiling. My husband got him down and sent him on his way to his burial at sea. It was the evening from you know where. I need a long weekend at the ocean. Just me and the ocean. Thank you Linda. I’m glad you enjoyed it. Wow! What an evening that was for you! I’m sorry. It is amazing how one thing can be a lot and then when we add more to it, how truly overwhelming it can be. You gave me a great idea… I live near the ocean so maybe I will go and spend some time there. I find any body of water to be peaceful. It is tourist season so it is often very busy, but maybe I can find a quiet place, or go to the river nearby which is also very relaxing. Thanks for sharing. Sending you peaceful, healthy wishes.